Panasonic/Sanyo’s goal is to use its unique technological resources to propose global solutions for life and the earth. Panasonic/Sanyo began research and development on Amorphous Silicon Thin Film technology in 1975 and on Single Crystalline Silicon in 1990. Panasonic/Sanyo combined these two technologies to produce a hybrid technology—HIT—their own proprietary design. HIT stands for Heterojunction with Intrinsic Thin Layer. 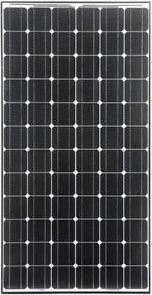 Panasonic/Sanyo’s solar panels boast high conversion efficiency ranging from 15.3 to 16.4, excellent temperature characteristics, and considerable output under diffuse and low light conditions. With their eye always on environmental impact, Panasonic/Sanyo uses less energy and silicon to produce HIT solar cells because they are made at lowered temperatures. While HIT solar cells are manufactured at 200° C during the p-n junction process, crystalline silicon solar cells are produced at 900° degrees. Panasonic/Sanyo’s production sites are located in Japan, Canada, Mexico and Germany. As of October 2009, their silicon wafers have come from California and Oregon. Panasonic/Sanyo’s solar panels are assembled in an ISO 9001 (quality), 14001 (environment), and 18001 (safety) certified factory. Unique eco-packaging minimizes cardboard waste at the job site. Panasonic/Sanyo panels have a limited 20-year power output and a 5-year product workmanship warranty.